I couldn’t stray from my now apparent Toyota bias. 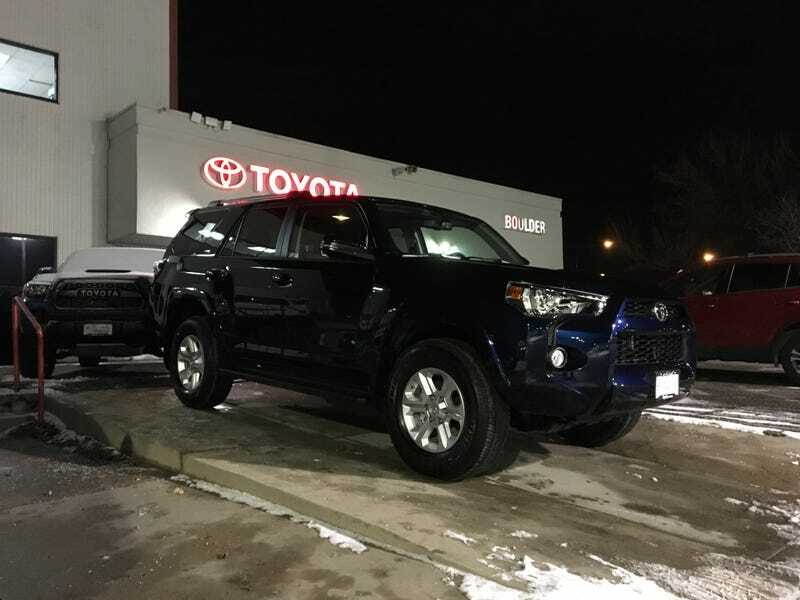 I traded in the Taco on a new 2019 Nautical Blue SR5 Premium 4Runner. What had become apparent in the last little while is that a pickup bed wasn’t needed for my DD. 99% of the time, the most it got was hockey gear. The Tacoma was a great truck, and it stayed with me for nearly 4 years. In the end though, I was ready for a change and ready for something a little more comfortable for me and my family. The numbers? 45 months of Tacoma cost $4135 in depreciation. The dealer gave me $27k for trade in. I picked up the new 4Runner for $36,484 about $4k under MSRP. Options are sunroof, third row seat, floor mats, running boards, and I think that’s it. Had the Off Road offered the third row, I probably would gone that route. We won’t use it often, but we will be glad to have it when needed. My son will fit back there for a while, yet. Boulder Toyota was actually easy to deal with. I thought the price was fair, the trade in was fair, and it was only one “trip to the manager” negotiations. Will I miss the truck? Sure. I’m also sure the 4Runner is the right vehicle for us right now, and hopefully for a long while. Plus it opens up the possibility of a sweet old pickup for a project. Better day time shots to come tomorrow. Bye, Taco!